Biographies of Famous Painters of Ireland, Born in the Eighteenth Century. 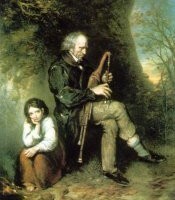 Alphabetical list of Irish artists, born before 1800.
the early Irish genre painters. one of the earliest Irish portrait artists. West, Robert Lucius (Portrait and Subject Painter), (1774-1850). A self-taught artist, Henry Brocas practised as a Dublin-based landscape painter, mainly in watercolours. In addition, he was also a successful engraver, etcher and illustrator, and produced numerous portraits, and political caricatures for magazines and periodicals of the time. He was a regular exhibitor in Dublin, contributing several drawings to the Royal Hibernian Academy. On the retirement of William Waldron, he was elected Master of the Landscape and Ornament School of the Royal Dublin Society, a post he held for 36 years, during which time he taught two generations of Irish artists including the celebrated Romantic Sir Frederick William Burton. All four of his sons (James, Samuel, William and Henry junior) became artists. On his death, he was succeeded by Henry junior, as Master at the RDS, while William later became President of the Society of Irish Artists. The fourth son of Henry Brocas senior (1762-1837) - a celebrated engraver of portraits and landscape painter, who rose to become Master of the Landscape and Ornament School of the Royal Dublin Society - Henry junior also had three artist brothers: the animal painter James Brocas (1790-1846), the landscape artist Samuel Frederick Brocas (1792-1847) and the portraitist and figure painter William Brocas RHA (1794-1868). The family's artistic tradition spanned almost a century between roughly 1780 and 1870. Henry junior was himself a landscape painter and engraver. He specialized in watercolour views, and exhibited at the Royal Hibernian Academy during the years 1828, 1841, 1853, 1856, 1860 and 1872. His engraving included several works by William Hogarth (eg The Election), and a series of "Views of Dublin" - a collaborative effort with his brother Samuel, who did the drawings. After his father died, Henry Brocas junior succeeded him as Master of the Landscape and Ornament School of the Royal Dublin Society, although teaching did not prove to be his forte. The sister of the miniaturist Franklin Drury, Susanna produced a number of landscapes of scenes in Ireland and England. She was also a book illustrator. She is noted for the two engravings of the Giant's Causeway in County Antrim, created by Vivares from her two watercolour paintings (gouache on vellum, 1740): one of the East Prospect, the other of the West Prospect of the Causeway. The original paintings were exhibited at the Royal Hibernian Academy in 1858. However, Drury also executed several other works featuring the Causeway. Surviving examples include two drawings in chalks and one in ink. Her focus on the Giant's Causeway not only brought fame to the local region, it also triggered a mini-boom in the popularity of Irish monument painting. The Dublin Society (later the Royal Dublin Society) acknowledged her efforts with its first award in 1740. Her original gouache drawings now hang in the Ulster Museum of Fine Arts, in Belfast. Born in Dublin, Fisher was a self-taught landscape painter and engraver. At the age of 23 he received a special 10 guinea award for one of his paintings from the Royal Dublin Society. 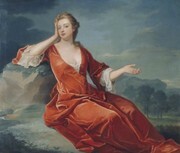 He contributed several works to the first exhibition of the Society of Artists, held in George's Lane in 1765, remaining a regular exhibitor thereafter until 1801. In 1768, he won the RDS best landscape award, and was duly patronized by the Earl of Portarlington. As an artist, he is best remembered not for his painting, which lacked imagination, but for his engraved views, such as his six "Views of Killarney" (1770), and six "Views of Carlingford" (1772), all produced in London from his original paintings. He also produced etchings featuring views of Cork, Belfast and Waterford. In 1792 he began a major series of 60 landscapes on "The Scenery of Ireland", drawn and duly engraved in aquatint. Fisher was also an art collector, gathering works by George Barret Senior (1732-1784), Angelica Kauffman (1741-1807) and Thomas Gainsborough (1727-88), among others. Born in Dublin, Ingham enrolled in the Royal Dublin Society's School, achieving good results in both drawing and painting before the age of 15. In 1815, he received an award from the Irish Institution for his history painting "Death of Cleopatra." After exhibiting several other works in Dublin, Ingham emigrated to the United States in 1816. He settled in New York City, where he became - with his brother - a leading portraitist, specializing in subject pictures and portraits of young high society women. Between 1826 and 1845, he completed over 200 portraits, such as "Flower Girl", "Day Dream," and "Portrait of a Child." His miniatures were also well received. In 1829 and 1842, he sent portraits to the annual Royal Hibernian Academy exhibition. Ingham became one of the founding members of the National Academy of Design (established in New York in 1826), and served as its vice president for a number of years until his death in New York in 1863. The son of a Scottish snuff-grinder, Gilbert Stuart was born in Rhode Island, USA. He took art lessons from another Scottish expatriate Cosmo Alexander, with whom he returned to Scotland at 17. Upon Alexander's untimely death his pupil returned to America, from where - after painting a few portraits - he returned to Britain, settling in London. Here he befriended and studied under fellow-American Benjamin West RA, until 1782, whereupon he opened his own studio. Stuart married well, and showed his portraiture at the Royal Academy up until the mid-1780s, achieving considerable success. It began with a showing of his work "The Skater", a portrait of William Grant, at London's Royal Academy of art in 1782. The work improved on the customary "Grand Manner" tradition of formal portraiture by portraying Grant in vigorous activity rather than in a static, formal pose. Stuart's rising fame soon lifted him into the first rank of society painters, and his prices were only exceeded by those of the court painters Sir Joshua Reynolds and Thomas Gainsborough. Unfortunately, in 1789, his wild extravagance forced him to escape his creditors by moving to Dublin, where his painterly skills and reputation quickly helped him to establish a lucrative portrait practice. Alas, he continued to overspend, and in 1793 moved back to America and opened a studio first in New York, then Philadelphia (where he executed his first portrait of George Washington) and Washington DC. His style was to emphasize facial characterization by eliminating unnecessary accessories, and he specialized in bust-length or half-length formats against dark, neutral backgrounds. A prolific portraitist, although slow to complete the details of his works, he executed a huge number of paintings of the high and mighty, some 40 of which now reside at The National Gallery of Art in Washington DC. Even so, his congenital overspending ensured that his finances remained precarious to the end. In addition, during his later years, he suffered from failing health. He died in Boston at the age of 72. Born in Ireland, the son of a Lancashire army officer, the details of Walmsley's early arts training (if any) and exact location (probably Dublin) are not known. A family quarrel when he was about 20, resulted in him going to London, where he worked as a scene-painter at the Royal Opera House. He returned to Dublin and continued painting stage-sets, this time at the Crow Street Theatre. In around 1790 he left Ireland and spent the rest of his life in England, practising landscape painting in watercolour and oils, although he revisited Ireland on several occasions to paint the scenery. Up until 1795, he exhibited a series of Welsh landscapes at the Royal Academy in London, followed in 1796 by a number of views of Killarney, which were printed and reissued in aquatint. According to Walter Strickland, Walmsley's paintings were "remarkable for the great luminousness of his skies." His works are represented in the collections of both the Victoria and Albert Museum and the British Museum. In his 40s, Walmsley's health began to fail and he died in Bath in 1806. Born in Waterford, the son of an alderman of the city, Robert West trained in drawing and painting at the French Academy under Francois Boucher (1703-70) and Jean-Baptiste van Loo (1684-1745), where he gained first prize for drawing. After returning to Ireland, he established a drawing school in George's Lane, Dublin. In about 1744, he was commissioned by the Royal Dublin Society to teach a class of 12 boy-artists at his school, an arrangement which developed further in 1757, when the Society established its own drawing school and appointed Robert West to run it. He became renowned as a great teacher, inspiring Thomas James Mulvany to comment that Robert West's chalk drawings from the living model "have never been surpassed and perhaps but rarely equalled...They are infallible models for study and have produced more good draughtsmen, and have impressed finer notions of the human form, than have the works of any other artist in the last century." Sadly, in 1763, West's mental health failed, and he was replaced as Master by one of his pupils Jacob Ennis. On Ennis' death in 1770, Robert West was reappointed, but died later that year. He was succeeded by his son Francis Robert West, who in turn was succeeded by his son, Robert Lucius West. The eldest son of Robert West (d.1770), who drummed into him the skills of drawing and painting, Francis Robert West was never a natural artist but he did become a fine draughtsman, with a deep appreciation for the structure of the human form. He worked almost exclusively in crayon, rarely using a brush. In 1771, after the death of his father, he was appointed Master of the Royal Dublin Society Figure School, achieving considerable success as a teacher. He also exhibited widely at Dublin venues, like the Society of Artists in William Street, his works consisting mainly of portraits and figurative pieces in crayons and chalks. In addition to his painterly profession, Francis Robert West was a classical scholar with wide literary interests. His portrait, painted by his son Robert Lucius West used to hang in the Council Room of the Royal Hibernian Academy. The portrait painter Robert Lucius West was born into an artistic dynasty. His grandfather Robert West (died 1770) was the founder of the Dublin Society Drawing School, while his father Francis Robert West (1749-1809) was a draughtsman and accomplished classical scholar. Both men held the position of Master of the Royal Dublin Society Figure School, a position to which Robert Lucius West was himself appointed in 1809, and which he held until 1845. His art training began under his father in the Society's School, where he won medals in 1795 and 1796. Like his father, he exhibited numerous times with the Society of Artists, and in several other venues in Dublin from 1800 to 1820. He also showed at the Royal Academy in London (1808). He specialized in portraits and subject-paintings, in oils and crayons, which while not as well drawn as his father's work, nevertheless demonstrated considerable skill. In his portraiture he was considerably influenced by Hugh Douglas Hamilton. In addition to his painting practice, he also taught at the Dublin Society Drawing School, and in 1809, soon after the death of his father, he was chosen to succeed him as Master. Later, in 1823, on the foundation of the Royal Hibernian Academy, Robert Lucius West was nominated to be one of its original members. He showed works at the RHA almost continuously until shortly before his death.  For more about famous painters and sculptors in Ireland, see: Irish Artists.  For details about the structure of Irish art, see: Visual Arts in Ireland.  For information about the development of fine art in Ireland, see: History of Irish Art.